It was a marriage written in the skies – a love affair with aviation and a trail-blazing woman who adores all things planes. Seventy-odd years on and Noeline is no longer scared of planes. The fear she felt in childhood actually sparked a lifelong passion that has seen her learn to fly solo, join numerous aviation clubs and, more recently, volunteer as a guide at the Omaka Aviation Heritage Centre in Marlborough. Noeline loves aviators and farmers and seamen. They talk sense. They talk straight. During several decades as a nurse in New Zealand, England and Singapore, Noeline relied on having something to keep her balanced and grounded. Working as a public health nurse, she knew everyone in the community – and they all knew her – but it took a toll. She was there for their best times but also for the worst. Noeline was working in the Coromandel when she decided learning to fly would be a good hobby. There weren’t too many women in the Mercury Bay Aviation Club in 1972, but she adored it. It took a while to get her hours up. Unfortunately, the training plane was often over at Little Barrier picking up another lot of crayfish, so it wasn’t until 1992 that she completed her first solo flight in a Cessna 152 at the Tauranga Aero Club. She’s always been a boundary pusher. There was the time during intermediate school when she spent time on the headmaster’s mat for choosing motor mechanics as her elective subject. Don’t be silly, he said. It’s the 1940s. No girl studies that. She then broke the rules by becoming the first married woman to be employed by the Southland Health Board. Don’t be silly, they said. It’s the 1950s. Married women are only going to get pregnant. It happened again when she became the first female breadwinner working for the Defence Force. No way, they said. She’s stepping out of line. Noeline still laughs at that – she’d put the cat among the pigeons. 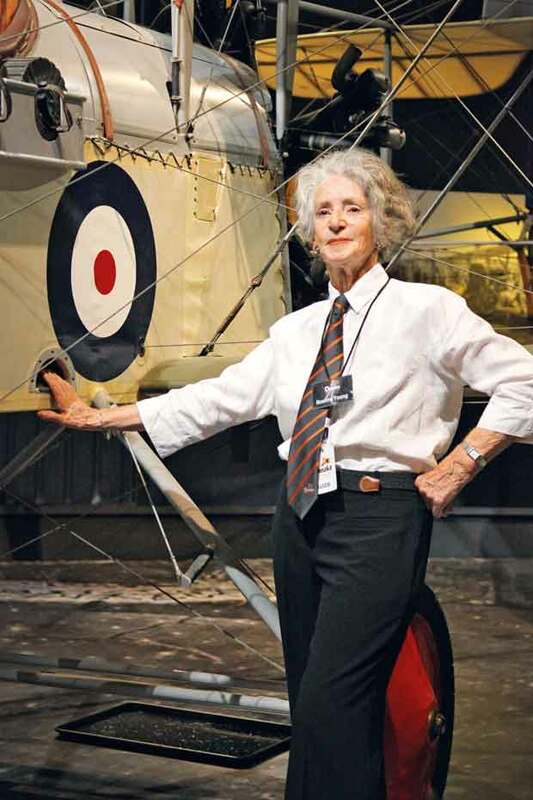 Noeline turned 80 last Christmas Day (a milestone that came as a bit of a shock – she can’t remember growing older), and she’s still happily ruffling feathers as the first and only female guide at the Omaka Aviation Heritage Centre. Sharing her love and knowledge is her way to give back to a field that makes her heart happy while keeping her mind sharp and her social skills honed. She dog-eared plenty of World War One library books while studying for her twice-monthly job, but it was Mr Wilson who really brought it home. While Noeline was working in England way back, she met 100-year-old Mr Wilson, a former pilot in the Royal Flying Corp.
She would sit by his side listening to tales of the war, such as how they would write observations on a pad strapped to their thigh, then place the note into a ‘flyer’ to be dropped out of the plane and down to the waiting troops below. It wasn’t until she spotted one such flyer on the side of a plane at Omaka that it hit her. It was a real story, with real people. She keeps a photo of Mr Wilson with her. Women and children are her “guiding” speciality – she leaves the engine talk to the blokes although she occasionally enjoys shocking them by dropping a knowledgeable comment. To her there’s nothing better than seeing wives and girlfriends enter reluctantly and leave enthralled. Regardless of genger, age and background, everyone walks away in awe. Many visitors have personal connections; while walking and talking they begin to open up about their uncle, father, grandfather. It can be confronting. But the role of the centre, and of Noeline, is to honour aviation, not war – a position aided by her Baha’i Faith, which focuses on peace. Noeline’s tours also provide an opportunity to once again champion trail-blazing women.